April 15, 2016, 2:39 PM · Congratulations to Ziyu He, 16, of China, who won first prize in the 2016 Menuhin Competition Senior Division, announced Saturday. Ziyu was the only male competitor among 22 violinists in the Senior Division for 2016. First Prize Winner Ziyu He. The first-prize winner also will receive the one-year loan of the 1715 "Schneiderhan" Strad from Beare’s International Violin Society. Ziyu He was born in Qingdao, China and began the violin at age five with Xiangrong Zhang. Since 2011 he has studied at the University Mozarteum and Leopord Mozart Institute, with Paul Roczek for violin, and since 2014, with Thomas Riebl for viola. 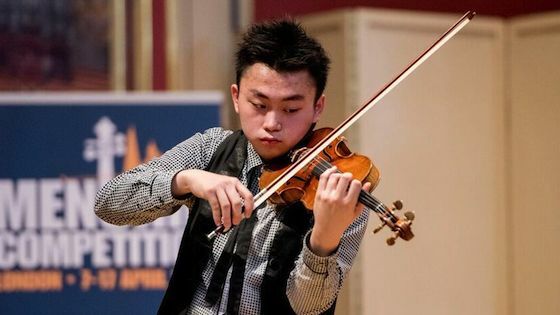 He has won a number of competitions, including 2014 Eurovision Young Musicians, Instrumental Wettbewerb Markneukirchen and the 2015 Zhuhai International Mozart Competition for Young Musicians. On Friday, the Junior Division Laureates were announced, with Yesong Sophie Lee of U.S. winning First Prize. Click here to hear their performances. Senior Division finals were not live-streamed. 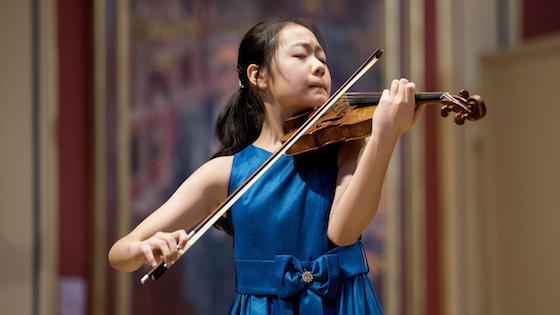 This is not the first time Yesong Sophie Lee has been in the Menuhin Competition; she was the youngest competitor in the 2014 Menuhin Competition in Austin. After making her solo debut with the Seattle Symphony at age 8, she has gone on to perform with many orchestras and will play again with Seattle Symphony in 2016. An enthusiastic orchestral and chamber musician, she has been concertmaster in the Seattle Youth Symphony Orchestra and plays in a string quartet. She studies with Simon James and piano collaborator Hiro David in Seattle and has played for Augustin Hadelich, Paul Kantor and Brian Lewis. She also won the 2015 MTNA National Junior Strings Competition. Special awards will be announced later. The next Menuhin Competition will be April 12-22 2018 in Geneva, Switzerland. April 15, 2016 at 09:47 PM · I wonder how big a difference would make sitting in the audience instead of listening to the live stream on the Internet. I was expecting quite different results from those five! All in all, those young artists performed marvelously and it was a huge joy to listen to the finals. Congratulations to all! April 17, 2016 at 01:22 AM · Shocking, simply shocking. The (senior) finalist studying with one of the jury members came in 4th of 4, and the other 3 appear to have no obvious link to any of the jury members. I thought these competitions were all supposed to be rigged? April 17, 2016 at 04:20 AM · Well, not 4th of 4. April 17, 2016 at 03:27 PM · Jeein Kim studies with Dong-Suk Kang, and came in 4th out of 4 finalists. One might allege that the teacher connection got her to the finals (I do not have an opinion either way, having not listened to the performances), but hard to argue that it helped her once she was there. 2 years ago, NL's tabloid was all in a tizzy at the fact that 5/6 of the IVCI finalists were Korean women, and many had links to jury members. This competition, 3/4 of the finalists were Asian women (all of them Asian), only 1 with a teacher on the jury (and as mentioned, that link didn't help in the finals). Less appearance of possible conflict of interest, slight increase in diversity in the finalist group (at least on nationality and gender), one might think this was worthy of some mention, but not in NL's eyes, apparently. Without a cranky letter from an eminent teacher whose student didn't make the finals, apparently not much of a story here to generate those all-important page clicks. Rereading some of the commentary on NL's website at the time of the 2014 IVCI, some of it sinks pretty low. Notable case in point: commenters attacking Laurie Niles' playing and saying that she has no right to be judging the performances of the competitors. Anyone ever heard NL play the violin? First time I've heard Ribiero and Kowalski described as "dismal educators", too! April 18, 2016 at 02:29 AM · *Of course* the males always stand out, don't they? April 18, 2016 at 03:47 AM · What's NL?